Since 1994 I've written in excess of 100 product reviews for astronomy magazines on both sides of the Atlantic. I decided to create ScopeTest.com to act as an archive of my former reviews and to run in parallel with my print/online media work. Here I'll feature 'scopes and accessories from across the astronomical equipment spectrum that may not appear elsewhere. Anyone with a keen interest in astrophotography will eventually consider buying a quality refractor. The unobstructed aperture, high contrast images, robustness, optical stability and relative immunity from misalignment are all highly desirable characteristics for imaging. An instrument employing FPL53 glass, preferably of a design comprised of three or more elements, makes it easier to design a telescope that will have tight control of false colour, off-axis aberrations and field curvature over a wide focal plane. Instruments meeting these criteria are worthy of the title astrograph and are naturally expensive, but Telescope Service’s 65mm f/6.5 quadruplet promises premium performance at a sensible price. 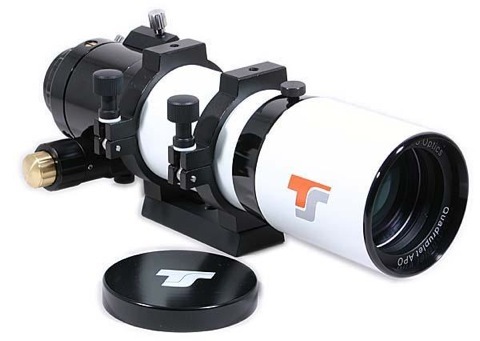 Click here to find out if the TSAPO65Q is “the little ‘scope that can”. Where do I find basic information about telescopes? If you're new to telescopes and are rather bewildered by the various terms used on this website, or if you're looking for your first instrument and don't know where to start, please follow this link for a primer. If your equipment search is more general, try here too. Either way, you will find plenty of help and advice to get you up and running. Aside from my archived reviews and selected new material that will appear here, I hope that my Almanac and Scope/Webcam/DSLR calculators will also be of everyday benefit to observers.